Originally published by The Anvil (PDF File). Fascism, in various guises, is on the march in most advanced Western countries and some underdeveloped countries. The extent of its rise is related to the history and the state of society in each. The situation is most severe in Europe, where liberal capitalists’ illusions about the “end of history” have been shattered most cruelly. Mass Fascist parties have risen in Austria, Belgium, Finland, France, Germany, Greece, Hungary, Italy, the Netherlands, Sweden and Ukraine. In Austria, they have even entered the government, while in Ukraine they were officially part of the government for a time after the Euromaidan protests. In addition, the governments of Hungary and Poland are hard Right wing national conservatives. They share some of the features of Fascism and are implementing parts of the Fascists’ program. Meanwhile, the Russian government openly collaborates with Fascists both at home and abroad. Two factors have been driving this. Firstly, Europe is a more accessible destination than Australia, Canada and the US for migrants from the Third World fleeing poverty and oppression. It has traditionally been a source of emigration, not a destination for immigrants. Accordingly, many societies are experiencing challenges to deep seated nativist currents for the first time. The capitalist class cannot resist using cultural anxieties about immigrants to divert popular anger so they do not become targets themselves. The Fascists are able to take the capitalists’ racism to its logical conclusion, arguing forcefully for what the capitalists usually only imply. The second factor is the failure of the European Union. The EU is a utopian project, aiming to solve the fundamental problem of Europe – the fact that the forces and relations of production there have far outgrown the suffocating confines of the nation state. While the problem is intractable under capitalism, there is no law of history that says you can’t try. Thus the EU. What has occurred in Europe is that the project of economic and political integration has become trapped half-way. The capitalists have found they cannot drive it further, while a return to unco-ordinated national autonomy would produce economic ruin. On the other hand, the current shape of the EU is dysfunctional, producing both neo-liberal austerity and pointless bureaucracy. The Fascists advance a solution – to cut the Gordian knot of the EU and make somebody else pay the costs of its break-up. This is a recipe for war against both the enemy without and the enemy within. The parties of the political Centre, meanwhile, are like kangaroos in the headlights – doomed if they stay where they are, but frozen into immobility. In the United States, an entrenched two party system has prevented the emergence of a mass Fascist party, but there is a plethora of new Fascist groups trying to take advantage of the social toxins released by Donald Trump. The US has its own cultural anxieties around immigration. In particular, racists are agitated by demographic trends indicating that at some future date, white people (a category subject to moveable and conflicting definitions anyway) will decrease from being a majority of society to being merely a plurality. Once again, in a society founded on genocide, slavery and violent racism, capitalists use immigrants and ethnic minorities as lightning rods for discontent and Fascists take the capitalists’ racism to its logical conclusion. While the growing Fascist current is yet to take clear organisational form, there are worrying signs that the Republican Party may be vulnerable to Fascist colonising. In Australia, the Fascists are still marginal, having their political space largely taken up by the hard Right half-way house of Pauline Hanson’s One Nation. Hanson has worked hard to keep open Fascists off her candidates’ list, though one or two have slipped through and it’s clear her party is infested with them at the grassroots. Organisationally, Fascists in Australia have proven a disaster, a pantomime on the theme of “Everybody wants to be Führer”. It would be a serious error to be complacent however, because a talented leader could come along tomorrow and unite them. Further, even disorganised Fascists can be dangerous for Muslims, Jews, African immigrants and others. One thing holding back the development of Fascism in Australia, though, is the fact that the capitalist class here is conflicted about fomenting racism. While all the usual minorities still function as attractive lightning rods for internal discontents, there is an external constraint. 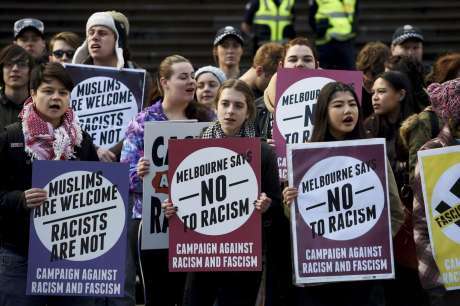 Australia, being a European settler outpost on the edge of Asia, is vulnerable to being denounced as racist by Asian governments and locked out of trade with the region. This would be a disaster for Australian capitalists and they have so far been much more careful and targeted in their racism than in Europe and the US. There are, however, no guarantees that this will endure in the event of an economic crisis.